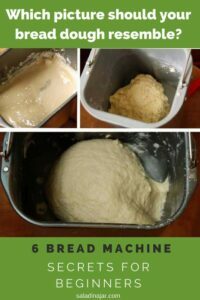 6 Bread Machine Secrets You Need To Know is a helpful guide for all bread machine users, especially beginners. Whether you are just now unpacking a new machine or digging it out of the attic, don’t miss these hints from a bonafide bread machine lover. Sweet Milk White Bread mixed and kneaded in a bread machine, but baked in a conventional oven. If Santa brought you a bread machine, you might be wondering where to start. Once you unpack and wash all the parts, here are a few recommendations you may or may not find in the manual. (If you are already an experienced bread-maker, skip this one.) If you have never made bread before, use a bread machine mix from the grocery store and observe the consistency of the dough in various stages. Begin with a simple recipe like pizza dough. It’s my favorite, and it’s almost fool-proof. Try focaccia with it, too. In the beginning, try to follow the ingredient list as carefully as possible for the maximum chance of success. Substituting whole wheat flour for white or even all-purpose flour for bread flour is not necessarily a 1-to-1 proposition. Different flours absorb different amounts of moisture and have varying amounts of gluten. All yeast is not the same. Don’t substitute regular yeast for instant or bread machine yeast. Each type must be handled differently. As you get experience, you will learn how to use either type of yeast in any given recipe. Do not fear opening the lid. Take a peek 5-10 minutes into the mixing process. I cannot stress this enough to avoid inedible surprises!!! If nothing is happening, the blade may not be present or engaged. Many times I have had to plunge my freshly washed index finger through the unmixed ingredients to push it down into the proper position so it could do its job. I’ve even forgotten to install the blade before adding ingredients to the pan. If the dough is too moist, it will level out like a thick soup. Add flour one tablespoon at a time until it makes a tacky ball that touches the wall of the pan and then pulls away. If the dough is too dry, it will form a ball that doesn’t touch the sides or may slap loudly against the side of the pan. (If it’s very dry it won’t even form a ball.) Add water one tablespoon at a time till you get a tacky ball. When you learn how to gauge the consistency of the dough and can add water or flour as needed, the bread machine world will be your oyster. Although experience is helpful, I’m hoping you’ll have beginner’s luck and your bread will turn out superbly the first time. Stick with the dough cycle only. In case you haven’t read my blog before, I rarely bake bread in my machine. I use the dough cycle to mix the ingredients and remove the dough to shape and then bake in a conventional oven. This method gives me more control, more shaping options and a better crust on the finished product. If I’m going to ingest luxury calories, they better be worth it. Bread baked in a bread machine rarely makes the cut. My favorite button on a bread machine. 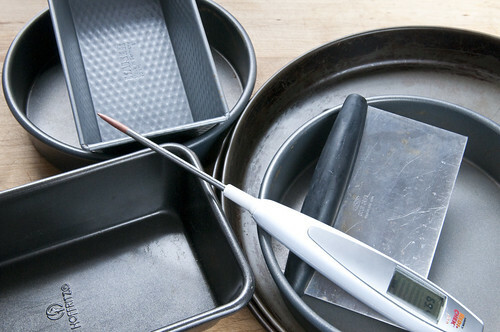 Invest in quality bakeware and accessories. If you want a nice crust on your bread, purchase good pans. I have suggestions. The last three items listed are excellent if you are a serious bread-baker. If your house is chilly, the dough may not rise to double in the time allotted by the dough cycle. Consequently, you may want to leave the bread dough inside the machine to continue proofing. To do otherwise will keep the yeast from developing to its full potential resulting in less flavor and dense texture. Consider moving your machine to a warmer spot in the house. Even though bread machines contain a heating element, the room temperature can make a huge difference in how fast the dough rises. Transfer the dough out of the bread machine pan into another bowl. Cover it. Set it inside a slightly warm oven or on top of a water heater or any place you know to be warm. If you have a question or things aren’t working out like you hoped, leave me a comment and I will get back to you ASAP. Still on the fence about buying a bread machine? Maybe this will help. A side-by-side comparison of bread baked in a bread machine to bread mixed in a machine but baked in a conventional oven. Find out how to convert your family's favorite recipe to a bread machine recipe. Don't miss this advice! It's crucial to your success with a bread machine. I use a Black and Decker bread machine and my bread is quite dry. What do you suggest? when toasted, it gets quite hard. I doubt if the dryness has anything to do with your machine…unless: 1. You are using the machine to bake your bread or 2. The machine doesn’t mix your bread very well. If neither of those are true, open the lid and check your dough once it is mixed. It should stick to the side, then pull away. Does your bread do that? If not, add some more liquid like you added originally. You can read more about this process here. Do you have this problem with all recipes or just one? That’s good to know that you should let your bread rise longer if your house is chilly. I wouldn’t have thought of that. I have started to make some bread and a bread machine sounds like a great way to make it a bit easier. Can I make bread dough a few days ahead and bake it the day of? Sometimes. Certain recipes are specifically designed to put the dough in the refrigerator for a day or two or three. Some work pretty well if you just chill overnight. Others don’t work as well. The dough won’t rise as high as it normally would. Are you thinking of a specific recipe? What is the difference between rapid rise yeast, bread machine yeast, and active dry yeast? How will using a different yeast affect my dough? Rapid-rise and bread machine yeast are essentially the same. They don’t have to be dissolved in water before you use them. Active dry yeast DOES need to be dissolved first in a small amount (1/4 cup for one package) of water. Then it can be added to the rest of the ingredients. Both of these types of yeast will have the same result in bread dough if handled correctly. I always lay my pan of rising rolls or bread on a plug in heating pad. The kind you would lay on your back when it’s sore. This gives the rolls some help rising and cuts the waiting time drastically. Thanks for sharing. That’s a great idea, especially in the winter time. Hopefully, you can turn the heating pad down low and it has a good thermostat. Happy bread-eating! I am short for time today and have not read all the comments. I live in Northern Ontario and am renting a row house which is heated with electric baseboards. There is no basement and our temps reach -40 F/C (same) for at least 2 months in the winter. I found that turning on the oven light creates a bit of warmth, close the door and let your bread rise in there as it cuts out the drafts and the oven light warmth is all I need. Great suggestion Audrey. Thanks for sharing. You are tougher than I am. Not sure I could endure those temps for 2 months! Just a quick question. Are recipes (in particular pizza dough) able to be halved when using a breach machine? I have only 3 people in our family and end up with much wasted product. I understand that dough can be frozen however we rarely have room in our freeze to take advantage of freezing any excess. How do I get my loafs lighters don’t fluffier. They all come out way too defenseand each. Going on my 5 loaf. I am brand new to bread machines. Are you baking bread from start to finish in your bread machine? If so, go back and read #4 in this post. Baking bread needs the human touch to obtain really good loaves. Sounds like your bread is not rising enough before it bakes. Take back control and only use the dough cycle, then remove the dough from your machine, form by hand, and bake only after the dough has risen properly. Hi, I’m not even sure if you’ll see this with it being so far after the posted date. But I am looking desperately for a whole wheat (Maybe white whole wheat) pizza dough. It doesn’t have to be 100% whole wheat although I’m fine with that as long as it doesn’t taste like cardboard lol, but at the very least a bit more than half is what I’m hoping for. Do you have any suggestions for me? Thanks. I hope this finds you, I’ve been searching the internet for weeks looking for a tasty yet healthish option. I was thinking of throwing mine away ,it is a Breadman plus,got it at garage sale,didn’t care for the bread baked in it,but after viewing your website maybe id like it just for the mixing,kneading steps.no manual or recipes came with it. Would you be able to give me a white or wheat flour,basic bread/roll dough recipe? I don’t like having to manually knead dough anymore in my senior yrs! Thank u in advance!! Those kind of recipes are all over my blog. Check the recipe index (tab at the top). 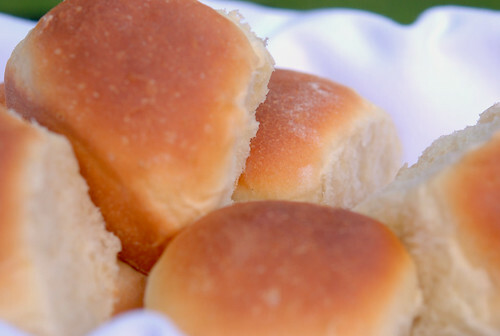 The Sweet Milk White Bread is my favorite as well as My Favorite Dinner Rolls. Happy Bread-eating. Thank you, thank you for helping me to troubleshoot a problem with mixing! I have one of those hole in the middle bread maker matchines and i have stopped using it after a couple of times because of that. I want to start getting back into making bread and other things that it can do but i still don’t know when too take it out of the matchine and put it in the oven. Can you please help me with this?? Hi Trish, In one sentence, use the dough cycle and remove the bread at the end of the cycle, form into desire shape, let rise until almost double and bake in your conventional oven. See this post for more info. Great read! Can I open the lid and try and shape the top of the bread just before it starts baking? I have seen directions for such a technique but I don’t recommend it. Your bread will turn out much better if you will remove it from the machine and bake it in a conventional oven. You might find this post interesting. So glad to find your blog. I just had my mom give me her toastmaster because i told her how many times i buy bread a month do to a toddler who love 12grain. I am always so busy that i cant bake bread normally and sge thought this would help. I have been intimidated by it until now thank you and wiah me luck! How can I make my breads taste sweeter ?? I follow sweet bread recipe exactly..the bread comes out perfect except I Find it not sweet enough. Please help…this is not a major issue but I would like to know know what I can do.My bread is made start to finish in the machine. Hi! My dough paddle will just randomly come off the shaft in the midfle of the cycle. Any idea why it would do this? I’m not a repairman but my guess is that the inside of the blade has routed out or else the post has lost its notch. I would call the 800 number listed in your manual. I didn’t understand the salt measure 2\3…. Is that 2\3 a teaspoon a 1\4 plus a 1\2 ? L put just over a half teaspoon …. I was wondering if you have ever done a double batch of basic white bread dough in the bread machine. I always take mine out as well and bake in a regular loaf pan, but our family has grown to 6 people now, and I would like to utilize the long loaf pan I have. My recommendation is to check your owner’s manual and see what is the maximum amount of flour they recommend for one batch. If doubling your recipe means you go over that amount, you risk having the dough kneaded improperly. If you use the machine to bake your bread, it could overflow the pan. Personally, I own two bread machines. If I need a lot of bread, I use both. Hey Paula nice blog. Your pics in step 3 really helped me out, was getting chronic dry loaves but not anymore! I’m tempted to try baking in the oven to better control the rise before baking. I’ve noticed the program on my bread machine includes a number of rises that are flanked by kneads that punch the loaf down, but the dough cycle is only 1 long knead then a long rise. When baking in the oven, do I take the dough out of the bread machine after the first knead/rise cycle in the program (ie after the dough cycle) or before the last rise/bake part (ie the entire loaf cycle minus last rise/bake)? FYI I tend to make loaves that are 3/5 whole grain, 2/5 all purpose, not sure if that changes things. Thanks for any tips! I don’t understand: why would i buy the bread machine only to use one cycle? Why don’t you bake the bread in the machine? 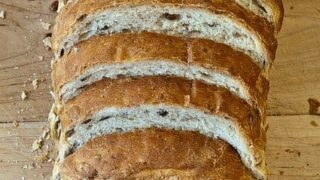 I am looking to bake my own bread because i can’t find fresh variety in my area and i want to control the ingredients. The honey whati bought home from the store the other day had crazy ingredients i never thought would be in bread. Maureen, Check out this post for more reasons why I love using a bread machine to mix and knead the dough but rarely use it for baking. You may not agree, but this is my personal preference. My Breadmaker quit on me. It did so while in the kneading cycle. I was heart broken. I was determined not to let the dough in the pan go to waist so I got what I could of it out and attempted to finish kneading it. I then covered it and let it rise until it was almost doubled in size …then I tried to make it into some rolls but it was kind of hard so I just rolled the dough into two balls and then let the dough rise again….then I cooked it until it was golden brown. Did not turn out too pretty but the taste was pretty good. My son told me he liked it better than the Breadmaker? So…….I guess I need to learn to knead most of all and practice shaping some maybe before investing in a new machine.? No need to learn how to knead. That’s what the bread machine does best. See this post. It’s the baking I don’t like in the bread machine. Not enough control. Sorry about your breadmaker. I’m currently on my fourth one. Hope you find a new one you like as well. hey, my bread machine is not producing heat, perhaps. IDK. How much time does it’s rod take to get warm or produce heat. HELP!!!! Can the dinner roll be turned into coffee bun? and IF so, how and what do I add ? Guidance appreaciated. Thank you so much? Paula, I don’t usually get excited enough to write but thank you, thank you, thank you for the wonderful bread recipe and technique. I FINALLY found a recipe (sweet white bread) that actually has the texture I have been seeking all my married life! I had totally given up making my own bread because after all the effort I put into making it, no one would eat it. Not that it tasted bad but the texture wasn’t like “store bought”. 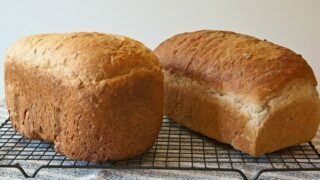 When I happened upon your blog a few days ago, I thought I would dig out my bread maker again and give it one more try. I have the same bread machine that you do but the product I would pull from that machine always looked like “brains”. I was looking on the internet for the reason why it turned out that way and that’s how I found your blog. I am excited to try your dinner rolls next. Again, thank you for the education on baking bread! My wholewheat bread won’t rise in the bread machine, what’s happening?? If it doesn’t rise at all, your yeast is probably dead, either because it is too old or you managed to kill it. Normally, whole wheat takes longer to rise so if you do not have a special whole wheat cycle on your machine, you might consider removing the dough from the machine once it is kneaded and allow to proof on the counter or in a warm place. Shape and bake in a regular oven for a much superior loaf. A crater in the top of your finished bread happens when the bread rises too much before it is baked, and the reasons for that are varied. But it is a perfect example of why I don’t use my bread machine to bake bread. My recipes work in any bread machine because they are not baked in the bread machine, only mixed, kneaded and allowed to proof. In other words, I mostly only use the dough cycle. Thank you so much for the hints. My parents just gave me their 11 year old Oster bread machine and I used it for the first time over the weekend. I used the basic white bread recipe and although I don’t think I used the proper amount of salt (I used my hand to measure instead of a measuring spoon) it was good. As you stated the crust was too thick and too crunchy when it came out. Once it completely cooled I put it in a plastic bag overnight and that took care of the too crunchy crust but the blade baked into the loaf and left a huge air pocket in the bottom. Is there a way to set the machine to just make the bread but not bake or do I watch the machine until the 2 rise is done? Most machines have a dough cycle you can use when you don’t want to bake it. Maybe your machine is too old for that. If so, take it out after the first rise, shape the dough, and let it rise again. My bread dough separates when being mixed with the bread hook of my mixer. I have added oil and water which helped some, but is it too dry? It separates as into two balls rather than one. Yes, Kathy. it is way too dry. I would add more liquid (a tablespoon at a time), however, it is actually easier to hold back some of the flour, say half a cup and add if you need it. You want the dough to stick to the side, then pull away cleanly. If you go to this post and watch the video, you will see what most doughs should look like when they have the proper proportion of liquid to flour as they are kneading. Even though I almost always use a bread machine, the dough will look the same. Paula, thank you for the wonderful recipes and ideas. You got me started baking bread last summer and I am in love! The machine I am currently using has a 1 1/2 hour dough cycle. My question is: do I really need to wait out the last rise? My machine does a last 50 minute rise. Can I transfer my bread to the pan and let it do the last rise in the pan? Also, I am wondering if you have any tips for covering bread during baking? I use foil now but feel wasteful as it is difficult to use more than once (at least it has been for me). Yes, it is important to allow the dough to rise to double before you put it in a pan or make into rolls. This is the time the yeast develops flavor. You will be compromising the final product if you shortcut this part of the process. You don’t have to leave the dough in the machine–you could remove the pan to warmer spot but don’t get in a hurry to put it in the final baking pan for the last rise until it’s ready. Regarding covering the bread dough, I use the free shower caps one gets in hotels. They are reusable and the elastic keeps out the cold air. Perfect!! Hi Paula, I am so HAPPY I found your website tonight. I have a bread machine that has been collecting dust for over a year or so. 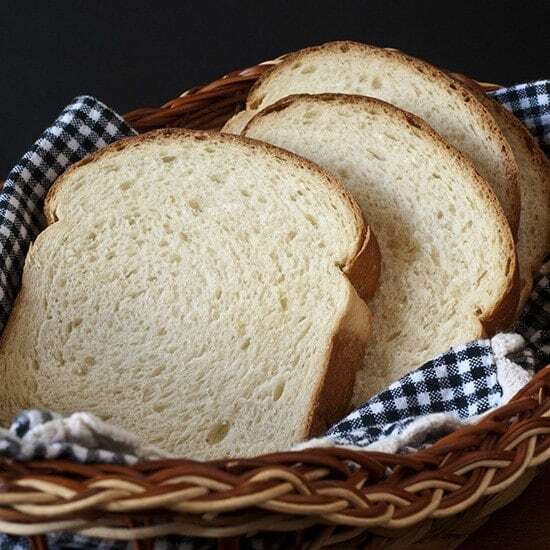 I LOVE bread and I thought for sure when I got a bread machine I’d be eating homemade bread daily, but after using it a few times I wasn’t very impressed with the bread crust and I too didn’t care for the weird hole in the bottom. The pizza crust came out well, but I thought it was just too much work to get it out just for pizza crust. After reading over your recipes I am once again excited to dig out my bread maker and try it out. Thank you for sharing your bread know how knowledge and recipes with us. It it wasn’t 1:30am I’d start digging it out and start making bread now. lol Thank you once again, Paula. I’ve pinned many of your recipes on Pinterest. I have a question about bread texture. I’ve been baking bread on and off for many years however just recently bought my 1st bread machine. So far I think it’s working great. The loaves I’ve made in it taste great and the texture is pretty good too. However, my husband, who loves my homemade bread for making toast will not eat a sandwich made with it stating that it’s not soft enough like store-bought bread and still insists that I buy it for his lunches. Is it possible to make homemade bread that more closely resembles the soft texture of commercially made products? If so, what ingredient should I be adding to achieve this? Have you tried my Sweet Milk White Bread? It has a wonderful, soft, tight texture more like commercial white loaves only much better tasting. If you follow the directions to bake in your oven instead of the bread machine (still mix and knead in the machine), the crust will be so much nicer. I predict your husband will love it! Thanks for the recipe! Yesterday I experimented with a whole wheat recipe and swapped some of the ingredients to achieve the soft texture I was after. I used buttermilk instead of water and olive oil instead of butter. I also added 1/2 cup of reconstituted potato flakes +1 T. of gluten flour to the dough and used molasses instead of sugar. I used the dough setting on my machine and then used the dough to make hamburger buns for my turkey burgers. The buns turned out great and the texture was very soft and chewy. Even my picky husband commented on how they were very close to the softness of grocery store bread. I think you are correct in that the bread machine dries out the bread too much during the bake cycle. Which is somewhat disappointing. 🙁 But I love the dough cycle! I can definitely work with that! I have such a hard time getting the bread out of the pan once cooking cycle is complete. Any tips? The paddles often stick in the bread and have to be cut out, or they remain in the pan and rip large chunks out of the bottom of the loaf. We’re using a basic recipe from all recipes, we’ve had to make a few substitutions (such as extra water to get proper rising) but it tastes great. Emma, I have found that if I grease the paddle with cooking spray or oil before placing it in the pan, the loaf comes out easier. Also, if the paddle does get stuck in your bread, the little metal hook that came with your machine will extract it easier than cutting it out and will leave less damage. I’ve also read in a few places online that some people will remove the paddle after the last kneading cycle by removing the dough ball, pull out the paddle, then put the dough back in to rise and bake. I’ve been trying different bread doughs in my bread machine as my husband is on a severely sodium restricted diet. My kitchen tends to be a little cool so I’ve been preheating my pan along with the oven for about 5 min. I shut it off, take out the pan and cover it with a towel, to heat it. In a pinch, I microwave the towel for a min. and then cover the formed dough. Its been working gr8! Made cardamom bread for first time yesterday and it was amazing! My Swedish family will be thrilled! I tried to make oat flour bread by substituting 4.5 cups of wheat flour called for in the bread maker recipe with 4.5 cups of oat flour. I also substituted 2 T of brown sugar with 2 T of agave nectar, and used 2 Tsp instead of 3 Tsp of oil. It did not rise properly at all, it’s partially super dense or just a blob of dough-like flour. any hints on how to make a recipe with only oat flour work? There is not enough gluten in oat flour by itself to make a good loaf of bread. Needs to be combined with something that has gluten. Are you going for no gluten? I have not delved into the gluten-free arena so I am not an expert on the subject and cannot advise you. With all the substitutions you made, it would have been a miracle if your loaf was successful, so don’t be too hard on yourself. A double miracle if you were also trying to bake that loaf in your bread machine. YIKES! May I humbly suggest you look for a good gluten-free recipe from a breadmaking expert and follow it to the letter until you make a successful loaf and then make substitutions carefully, one at a time until you like what you get. Good luck! Should the liquids be at room temp or a little bit on the warmer side when adding into machine when starting cycle? Paula, Room temp is OK but if liquids are a little bit warmer, the dough will rise a little faster. That’s why I normally heat the liquid in the microwave 1 minute per cup. If using less liquid, heat it for less time. I made my first loaf , but it bubbled over very messy. My bread taste burnt? but its not ? I recently purchased a Oster bread machine like new! Can tell it has barely be used with all papers and recipe book! Only missing the box it came in! I have been wanting one for a while to learn to make our own bread! I came across this ridiculously amazing deal for it! $3.00 yes! I only paid $3.00 for it! So I was thinking I’m only out 3 bucks if it doesn’t work or i just decide I don’t like making bread! Well I know it works now only to see if I have the touch to make some yummy bread! I wanted to say Thanks for your beginners tips and advice! They have been very helpful for someone like me who is absolutely clueless and wants to learn! Thanks again! You’re welcome Erica. Happy bread-making. Hi, I am going to start a small scale bread manufacture. I need to know can cooling tower keep my products crispy and dry surface inside packing film. Because surface of my product is cookie style therefor its so important to keep my product dry in 3-4 days inside plastic package. First, I recommend you pick out one of my bread recipes and try it. I explain in detail when to remove the dough, what temperature to bake it, etc. If you want some general guidelines to use with your own recipes, read this post. Happy bread making. I pulled out my bread maker today and decided to start a loaf ( on as I type ). It has been awhile since I used it but bread is getting so expensive. My husband likes the oatmeal and honey bread. Does anyone have any ideas of how much of each I should add or maybe you have a good recipe for it. Enjoying all of your awesome ideas Thanks in advance. Shirley, you might try this recipe. Thank you for the recipe Paula, it is wonderful. I baked it in the oven, what a difference. My bread maker has been up on a shelf for a couple of years but it is got a home on my counter. My next recipe is pizza dough, I have been buying frozen dough from a bread store but not anymore. I will be freezing my own for now on. Thanks again. My pizza dough looks good till it time to roll it out ,then the elasticity has goge out of it so it wont roll why its the same recipe i’ve always used and it was fine before,so have i wasted all my pizza dough thats already made or can i save it. You may have tried this before, but, do you let the dough rest for about 10 minutes after you punch it down before trying to roll it? I don’t personally roll mine. The texture seems better if I just stretch the dough with my hands. Good luck. Hey!! I’ve made a few loaves in my bread machine and I can not get them right. I measure with military precision… I for know if it’s because I’m in the south and it’s so humid wear I live. Any suggestions? You can read most of my suggestions here. So i think my first attempt at bread baking is failing as we speak lol. Dont know what went wrong, it is baking inside the machine now but its not at all round. Its lumpy and has peaks. I thought maybe it would rise some while baking but its not, its baking into this really funky shape. !!!!!!! I just wanted to say thank you for the pictures showing too wet-too dry-just right. I couldn’t figure out why my dough was crumbly but was afraid to go against the recipes. It turns out that in my house, at least, I need to add an extra tablespoon or two of water to the dough to make it just right. I was on the verge of returning my bread machine until I found your site, and now I am going to town on bread. I’m going to try your cinnamon rolls next. Thank you so much! I juice every day. My juicer separates the pulp… I have been adding it to my breadmichine… Can’t seem to find the correct amount of veggie pulp to use? I would treat the pulp as a liquid. See this post for proportions you normally need to follow when making bread in a bread machine. Paula, My Zojirushi supreme just arrived today! I have a loaf baking in the oven now….but I have another question….Do you let your dough rise on both risings in the machine (the 1:50 setting) or do you take it out of the machine after the first rising? Paula, love your posts….I was wondering if you use reg tap water for your bread and if it is heated at all….some bread books say spring water is the best, but that seems troublesome. Please help…. (new to the machine)! PS…is the butter in your recipe melted? Yes, I use regular tap water. I heat one cup for one minute on HIGH in the microwave. (This is not absolutely necessary, just shortens the first rising time a bit.) Adding a cold egg, and butter to the water cools it down and warms up the butter and egg. I don’t normally melt the butter. I just slice it up quickly and let the warm water soften it while I’m throwing all the ingredients in the pan. Good luck with your machine. Always glad to answer questions. I use my Z bread machine that my husband got for me last year to bake bread , dinner rolls & pizza dough following your instructions. But of late the bread either falls down after baking, doesn’t bake through or is lumpy. Do you check your dough after the machine starts? Sounds like you may need to make some adjustments. See this post for more details. Some other possibilities are old yeast or killing the yeast you use with too high temperatures or perhaps the ambient temperature is too cool. You may need to move your machine to a warmer place in the house or remove the dough from the pan and let it rise in a warmer location. I love making Pizza with my Bread machine..Just wondering can i use my pizza dough to make rolls..
Pizza dough makes great bread sticks. Great post, and I love your suggestion to bake in the oven not the machine. One question. Every time I use the express bread setting (and “rapid rise” yeast) in my machine, I consistently get good bread. But every time I try to make any of the “regular” breads (with active dry yeast), the dough ball NEVER rises enough. I’ve tried every suggestion in my bread machine book (more or less water, more or less flour, fresh yeast, fresh flour, room temp., etc.) and nothing works. Any suggestions? Is it possible to replace active dry with rapid rise in the same measurements? Active dry yeast works best when it is dissolved in liquid first. Furthermore, it takes longer to rise. I recommend you use bread machine or instant yeast for all recipes you make in your bread machine. It’s the only kind of yeast I buy. Thanks for the very helpful tip! I just got a bread machine for Christmas and I love it. I have used it some for baking because sometimes I’m just lazy and it’s still far better than store bought sliced bread. I have also found that eating the bottom of the loaf first is better because it’s the most dense so it’s better when it’s fresh, the top of the loaf is fluffier so starting at the bottom seems to give it more uniformity as the top dries out while it sits for a few days. I have used the dough-only cycle and I was also very satisfied when I took it out and baked it myself too. I wouldn’t call myself an inexperienced baker but I do feel have a lot more to learn before I’ll feel comfortable changing up any recipes or making my own. But what I’m curious about is the fact that I have a kitchen aid stand mixer and a food processor that both have a dough hook and a dough “blade” and I’m surprised at the lack of recipes online that actually use them. Therefore, I’ve hardly used them. Do you have any experience with dough hooks or “blades” on a mixer or food processor? If so, would you say that using the dough hook or “blade” is similar to using the knead only cycle on the bread machine and it would be okay to knead most bread recipes with a dough hook for 10 or 15 minutes with intermittent rising and resting times just like the bread machine does? I have made wonderful bread with my Kitchen Aid, my Cuisinart food processor, and my bread machine. The difference is that you need to know when to stop or keep going with the kneading when using both the mixer and the food processor. You have to pay attention and stop the machines manually. 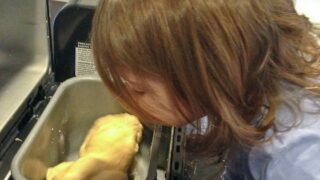 Then you have to handle the dough and set it up to proof. The bread machine allows you to dump in the ingredients and pretty much walk away until the bread has doubled in size (finished the dough cycle). It’s so much easier to use the bread machine that I rarely use my mixer for bread and even more rare that I use the food processor (easy to overdo the kneading in a processor). THe answer to your last question is “yes” but why would you go to all that trouble if you have a bread machine? Thanks for writing and I hoped I’ve answered your questions. My daughter bought me a Russell Hobbs with the glutenfree and popcornfunction. Must the lid be allways ontop of the breadpan. Can I interrupt the functions because for example the glutnfree bread. Bake to dark. I am not familiar with a Russell Hobbs. All bread machines I know of will allow you to open the lid and make adjustments such as additional water and flour if needed. I have never made gluten-free bread so can’t offer you any assistance in that arena. I just purchased a New Breadman Machine. Well, the first loaf is sitting in backyard as a lawn ornament. It turned out rock hard. I followed the receipe for Basic White bread to a T. I then made a second and this time not so bad, but good enough for the garage. Now I am on my third loaf. I will let you know later how that one turns out. I am not discouraged for someday I will conquer the Bread Machine. Have you seen this post? When you get tired of baking bricks, check it out. Also, you might want to try a different recipe. My Sweet Milk White Bread is tastier than any recipe I’ve ever seen in a bread machine manual. My bread machine is over 20 years old and it still works great. I would like to make pizza dough but do not have a “dough” cycle. How do I know when to take the dough out of the machine? Remove the dough after the kneading is done and let it rise. Deflate and form. OR let dough rise once in the machine and them remove and form. I am new at bread making & this machine is new to me. The last 3loafs only one half seems to rise…. Any way to make it more uniform? I suspect your dough may be too dry. Hold back 1/4 cup of the flour and only add if you need it. Your dough should look like this picture seen here. Personally, I do not ever bake bread in my bread machineso my finished product is guaranteed to be uniform and even. I use my bread machine at least 3 times a week. I used to get very frustrated because the digital display window is very small (so the lettering is very small) and also it’s a light grey and the lettering is dark. I guess you get the idea that it’s difficult to see what I’m doing but the worst part is that it’s on the TOP of the machine. I’m only 5′ tall so when it’s on the countertop I have to stand on a footladder to try to read it then it’s still difficult. Then one day I had an epiphany. I put an unused LR end table in the kitchen next to an outlet. Now I can see the digital display and the dough-viewing window with no problem. I love it. It doesn’t take up valuable counter-space and I never have to put it away. Great idea Betty. Thanks for sharing. After several attempts with my new bread machine, I had success with a beautiful loaf of bread. The very next baking, my bread had a dip the middle. The difference? I used water in the successful loaf and used water with 1/2 cup yogurt (because I used the 24 hour soak method) in the loaf with the dip. Milk was in my first few attempts before my successful loaf and, as I said, yogurt was in my last attempt after the successful loaf . No other ingredient or measure was different between the successful loaf and the loaf with the dip. Could the presence of milk/yogurt be the culprit for the dip in my unsuccessful loaves? If so, what can I use that isn’t dairy when I use the soak method? Nice to hear from you. Unfortunately, I have never milled my own flour so I have no advice regarding the whole soaking process and what it does to your bread. My only question is, “Are you baking your bread in the bread machine?” If so, you have less control over how things go which can lead to the dip in the middle. I suggest you take the risen dough out of the machine and bake it in your oven for much nicer and more predictable results. See this post. The first couple of times I used my machine it mixed it all perfectly then cooked well, then one day it didn’t it’s so annoying!! Have you ever used non wheat flour? Sorry about the unpredictable results with your bread machine. That’s one reason I never bake in my machine. I have never tried to make bread with gluten-free flour. I have no issues with gluten and I’ve heard it’s not very tasty so I’m not motivated. 🙂 Good luck with your bread! We purchased a Sunbeam bread maker about 2 yrs ago and didn’t have any luck with it…nothing came out right. We mill our own red and white wheat because its better on diabetics which I are one lol. Last week we decided to give it another try with a very basic recipe….flour, canola, water, sweetener, yeast and vital glutin. For some reason it worked like a charm the first loaf but flopped OM the next four. In searching for the answer, I ran across your article. As I was reading it I came across the pictures of the dough ball and….a picture is worth a thousand words…I suddenly knew what the problem was…too dry. We just put in a new batch and added water until it looked like the picture. We will see how it turns out. But thanks for taking the time to illustrate your article….it was really helpful. Did it work? Do you bake your bread in the machine or in your conventional oven? You might find this post helpful. Yes, it did work and I have successfully made several loafs since then. In fact, I’m getting ready to put one in right now. I am all new to this bread making thing. 🙂 I bought a bread maker and have been making my own bread now for the past two weeks. (So far, with success that I am happy with.) However, I do have a question: Do you let the bread dough rise in the machine, then roll it out, and let it rise again? Or do you pull the dough out right after it’s done kneading in the machine, roll it out, THEN then it rise? Check out this post. It will explain what you need to know. Write back if you still have a question after reading. My bread crust on the side and bottom is too hard. Are you actually using the bread machine to bake your bread? I don’t recommend it. See this post. I want to thank you for the many suggestions, ideas and tips! I love your blog and love my breadmaker. My husband had a heart attack and had to have to control his sodium and fat. It was easy for me to control our sodium and fat by making all our bread in Bread Maker. It is so easy and works like a charm every time. When you mention the house being too cool….what temperature are you talking about? would that affect dough? Our house is always cool . The last two times I made dough,…it doesn’t seem to rise as much as it should…I am thinking it might be underproofed but am not really sure. My ciabatta today was a bit flat and too dense. Yes, a cool temperature in the house will DEFINITELY affect the rising time needed for your dough. Are you using a bread machine? If so, it will warm a bit to help your bread rise but even so, a very cool house will cause it to take longer. If you are not using a bread machine, finding or creating a warmer place to proof your dough will help. My favorite thing way is to place a cup of water in my microwave and turn it on for 5 minutes. This will create a humid and warm environment in the microwave oven. Now just set your bowl of dough in there with it but of course, DO NOT TURN ON THE MICROWAVE OVEN WITH YOUR DOUGH IN THERE. Just close the store and let it sit and rise. Or, you could set covered dough bowl on top of your water heater, or in a slightly warm (80-85 degree F) oven. Hope that helps. I have one of the older bread machines and have not yet started a steady use of it. I have a hard time getting the bead flour around here. Can I use the all purpose flour instead? I do think i would liketo try and make it in the machine and then shape and bake it myself. I would love to be able to make cinnamon bread especially. Thanks for your articles. Keep them coming. Yes, Penny. You can use all-purpose flour. The amount required may be slightly more. I would get the unbleached if possible. If not, go with the bleached. That’s what I used for years until I discovered better. One question though: I really would like to make focaccia, but unfortunately my main oven is electric, will it fit anyways, or a fire oven is absolutely necessary? That whole wheat loaf sounds delicious. Wish I were your neighbor. I make focaccia all the time in my electric oven. My recipe is here. Gave it a shot today with a whole wheat recipe and it seemed simple enough. Got all the ingredients and followed each direction just like it told me. My poor loaf came out awful looking…more like a wheat mound and not lookin like a loaf of bread at all! Disappointed for sure. What went wrong? It’s very dense and hard 🙁 am I supposed to form the loaf before the baking cycle? Am I supposed to remove the kneading blade before the baking cycle? It was baked into the bottom of the loaf and I had to cut it out lol. Thank you! Your comment is the perfect example of why I do not bake my bread in a bread machine. I use it only for the “dough” cycle. 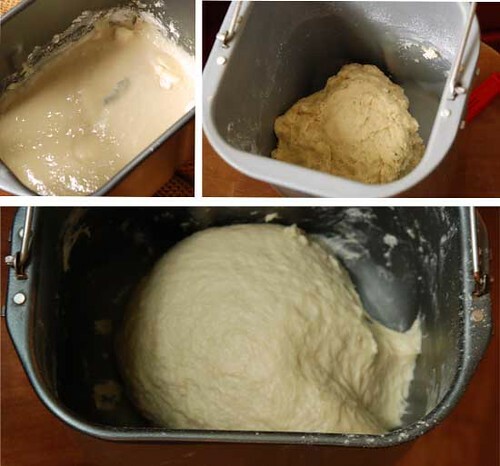 At the end of the dough cycle, I remove the dough and shape it–into rolls or place in a loaf pan. After the dough rises a second time, I bake it in the oven. I recommend you try one of my recipes such as this one for whole wheat bread or this one for delicious dinner rolls. Are you trying to bake the bread in your bread machine? I don’t advise it. I know that’s how the manufacturer sells it but I rarely do that. Read through some of my posts on using a bread machine for more details. The answer to your specific question can be varied and since you didn’t give details I can only guess. But in a nutshell, your bread either was allowed to rise too long before baking, or it contained too much yeast. You might check your manual for troubleshooting tips. Furthermore, I would suggest that making good bread is an art that takes some practice. Keep trying and learning and you’ll be an expert in no time. I too, am a bread machine FANATIC! I too haven’t had any success making the loaf in the machine. The loaves always come out dense, oddly shaped, overly tall and generally unloveable. I make fresh breads daily for my four hungry boys. here’s the only problem I have. Sometimes I’m running around all day like a chicken with my head cut off, and I don’t have time to make pizza dough, rolls, desert in the evening, or sometimes don’tfeel well. I don’t want to feed my kids hot pockets, or some other form of pseduo food. SOOO…can I freeze dough at any point in the process, sort of like the frozen rhodes dough? Can I freeze pie crust, pizza dough, bread dough, phillo dough? Maybe make stuff in mass bunches all at once, with less daily maintenance? The pullman pan sounds amazing if you want to make sandwich bread. Thanks for adding the link. About freezing, much depends on the particular recipe. I freeze pie crust all the time, but some recipes don’t freeze as well as others. Same with the other doughs you mentioned. It rarely improves the product but some don’t seem to suffer much either. It’s more a process of trial and error to find what works. Good luck. Hi! I have had my breadmaker for about 2 months and I use it about twice a week on bread. I made jam in it once, but even though the jam tasted good I really did NOT like the mess it made. Anyway, I had the same problem of the crust being way too thick the first couple of times, then I put it on light crust instead of medium and that did the trick. I was wondering if the dough could be taken out though and baked conventionally, so I’m really glad to find out I can do that so I’ll definitely try it out. What I was hoping you could help me figure out though is that I am having a problem with the dough falling somewhat. This didn’t happen until I began putting in wheat germ. The package suggests substituting half a cup of flour with the WG and while the finished product is pretty tasty and the dough does rise, it falls a bit and so isn’t quite as tall as it’s been before I put in the WG. Do you have any suggestions to fix this? Thanks! I have used wheat germ in my bread before–just for variety. But remember that wheat germ doesn’t have the same gluten as flour so it is going to weigh your bread down a bit. 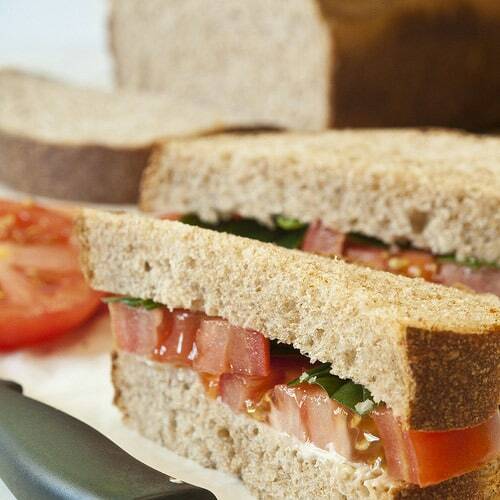 You could add some Vital Wheat Gluten to compensate (follow directions on the package) or use less wheat germ. Not sure what happened to your comment but sometimes, it is inadvertently caught in my spam filter which catches way too many for me to sift through for mistakes–like many thousands every week. At any rate, glad you wrote again. First, salt. I use whatever salt I can find first, although I know they are somewhat different in nature. But it doesn’t seem to matter with my bread. Second, Splenda. Although I am a big user of Splenda, I have not even tried it with bread. I’m just not brave enough to use sugar substitutes in baking anything. If I’m going to have those kind of luxury calories, I want it to be worth it so I use real sugar. So my answer is….I don’t know. Thanks for your reply, Paula. Following your advice, I’m starting simple and have only used packaged bread machine mixes so far. All good. But before “experimenting” with salts and Splenda, I think I’ll also follow your advice and go with the “normal” stuff first. Once I know those work, I’ll try experimenting a bit. Thanks again for your helpful reply, and thanks especially for your reassuring tips! Gratefully, Mickey. Re: Salt – you are obviously correct b/c salt is salt. Some have reported that coarse grained salt (Kosher salt) doesn’t always dissolve completely (depends on moisture content), but if they grind it up first then it works fine. Re: Substitute Splenda for Sugar – you can’t just substitute Splenda for sugar b/c it won’t activate the yeast. However, you can add a couple of teaspoons of regular sugar with Splenda and that will work. Or you can just use the “sugar blend” version of Splenda. Hope that helps somebody. Thanks again for everything, Paula! Best regards, Mickey. We like good bread! The cost of a good loaf of bread is close to $4, I counted the slices–15 slices. Most everyone I know has a bread machine and no one used them, I am on my third machine, I started using them back in the 80’s. I purchased my last one on Ebay, brand new and under $30 with shipping–a very good name brand as well. I can even stant the aroma of store bought bread in a plastic wrapper, look at the label and see what is in there. I purchase my bread flour at Sam’s club a huge bag for about $8 yeast there is about $4 for a double pound package. I know what we are eating and who had touched it. Good on both counts. Love you tips and recipes and so does my family! Can I double the sweet bread recipe in my bread machine so I can make two loafs at a time? Has any one tried this? I have never seen a bread machine that would make a recipe with 6 cups of flour. Most of them have a limit of 3-4 cups, some up to 4-1/2. They aren’t designed to knead that much dough, not to mention what would happen when it rises to double. My suggestion? Find another cheap bread machine on Ebay or at a garage sale. (I have 3 of them myself–for when I entertain e.g. Christmas and Thanksgiving.) You have to wash two pans but otherwise, it’s no big deal. I own many different bread machines all bought from a local thrift store excepting my original Hitachi SB 101. I have now moved onto only using their dough cycles (the 2lb Oster Express Bake is my favorite) but also wondering whether I should invest in a food mixer to do this. Online research shows that the new Kitchen Aid mixers do not stand up well to the heavy duty task of kneading yeast bread doughs. Bosch and Cuisinarts SM 55 mixers would be my top choice, but why spend so much if I only intend to make bread? Now that I am making baguettes and ciabatta loaves having bought a baking stone for my oven I have a new puzzle. What is the difference between “bread flour”, whole wheat flour that I grind myself from red and white hard wheat “berries”, and general purpose flour? How interchangeable are they? Does shop bought flour with a “best used by date” on its packet reduce the quality of a baked loaf as it probably is at least 3 months since King Arthur etc had milled it? I use my bread machine for kneading only and it does a wonderful job. I don’t need a food mixer to knead most of my bread–only refrigerator type breads like these bran rolls. Bread flour is not a whole wheat flour. It just has a higher protein content than all-purpose flour. You can substitute all-purpose flour for bread flour but it will not develop quite as much gluten which is desirable in many yeast bread recipes. Any kind of whole wheat flour, whether freshly ground or not, will change the game. Of course, freshly ground flour will taste fresher and seems to be loved by people who use it. I do not grind my own flour so can’t give advice about it. If i put my bread machine on too late in the evening, can I leave the bread in it till the next morning? Or should I set my alarm and take it out right when done in the middle of the night? I don’t recommend baking bread in a bread machine. Not worth the calories in my opinion but you probably already know how I feel about that if you have read any of my posts about bread machines. I use them for kneading and rising only. However, if you want to bake in them, yes, you can leave the baked loaf in the machine all night. Just don’t expect a wonderful loaf of bread like you would get if you bake it in a conventional oven, then remove it from the pan to cool. At least, that is my experience. The crust tends to be a little too thick and chewy. I have been baking Whole wheat bread with 3 cups white whole wheat flour and 1 cup bread flour. The taste is perfect, but it keeps getting huge air bubbles in it. I have been using the dough cycle, then taking it out of the machine and kneading it and letting it rise in my loaf pan and then baking for 20 minutes at 350. Huge air bubbles. What am I doing wrong? I can’t say for sure since I’m not watching you. However, I have two guesses. First, you don’t need to knead the bread after it goes through the dough cycle. It gets plenty of kneading in the machine. This could be introducing extra air. When you take it out of the machine, gently press the dough back to its original size so all the gas is squeezed out. Shape it and put in your pan to rise again. It’s also possible that you’re letting it rise too long before you put it into the oven. It should rise until it’s not quite double. Hope that helps. p.s. I also don’t know about your recipe. Maybe it calls for too much yeast, or not enough salt or something else. Are you using a recipe from a good source? Hi! I just tried making my first loaf of bread following the directions, everything was going fine, I had taken it out and kneaded it a few more times and shaped into a loaf, put it into a dark non stick pan and placed it in a preheated oven to 200 degrees for five minutes and then turned it back off. The directions gave that as a hint to be able to have the dough rise quicker. It was rising nicely, and I took it out of the oven to preheat the oven to 350 and I came to put it in, and it had fallen. Any ideas? I still tried baking it, the top browned well, but it is has dents in it. Thanks for any insights! I’m so sorry about your bread. Sounds as if it rose too much in the pan. I would think preheating the oven to 200 for 5 minutes is a bit too much but at any rate, you want your bread to rise a little less than double before you put it in your preheated oven. If you have a microwave, set a cup of water in there for 5 minutes on HIGH. Then set your loaf pan in the microwave to rise–along with the cup of water. It makes a nice, humid place to raise bread. Also, you won’t have to remove it to preheat your oven. Don’t be discouraged. The same thing has happened to me, more than once I’m afraid. I apologize if this is a repeat question, but with 87 comments, I don’t have time to read them all right now. If I am using the dough cycle, can I shape the loaf, put it into my oven immediately or does it need to rise again? Also, what temp on the oven? Hi, I a very very newbie!! My loving Hubby got me a bread machine for xmas :-). Ok, I made sweet rolls and they turned out yummy, but when I try to make a bread dough (to pan in the oven) the dough doesn’t mix together right, it looks like it’s rising but when I take the dough out it’s running at the bottom, I have tried adding flour when it’s kneeding but I’m still having the same issue. Thanks for any help. Help! I just put all ingredients in bread machine pan but can’t find the paddle. What do I do? I’ve looked everywhere. Can I make dough by hand using the bread machine prepped ingredients??? I just got a bread machine for Christmas and I like the idea of making bread in it but, it seems so heavy. I was wondering if you had any tips on how to make it more like the stores. Also, the best storing tips for homemade bread would be greatly helpful too. Try my recipes. Most of them are formulated for the bread machine and well-tested. And remember, I DO NOT bake my bread in the bread machine. It will not be like the bread you buy at the store if you do. Try this recipe for Sweet Milk White Bread. It is a winner! Regarding storage: Remember that homemade bread has no preservatives like store bought bread. I recommend you only make what you can eat in a day or two or be prepared to freeze it. Recipes with potatoes in them seem to stay fresh a bit longer. Like this one or this one. I added a little more water (1/8 of cup) and it became less dense. I have thoroughly read all your information for bread machine beginners and happen to have been given the Zojirushi machine you mention as one of your faves. I was attemtping my first loaf from a boxed bread mix and intended to only use the dough function. At one point, however, I realized the machine had moved on to the baking phase. I have scrutinized the machine’s manual and cannot find a way to prevent this from happening. Remembering that you mentioned setting it before you leave for church leads me to believe I am missing something. Any idea? Thanks so much! I just picked up a breadman tr441 on freecycle. Thanks for the visuals! Helped a lot! I received my bread machine for Christmas and am trying it for the first time! But for some unknown reason it’s not mixing?! Not sure what I did wrong?! 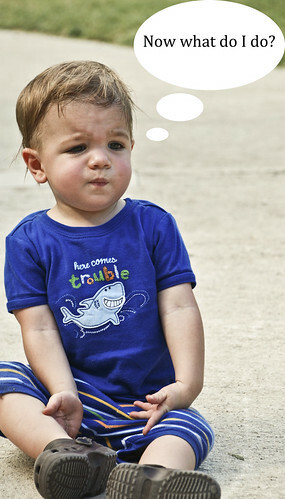 Any suggestions for this desperate Stay at home mom!! Much appreciated! Check to make sure the blade or blades are firmly pushed down on top of the little post. It they are not engaged, you will hear the motor running but see nothing happening. Happens to me all the time. If the motor is not running, I would call the 800 number listed in the manual. Hi, I just made my first loaf of bread using your recipe (sweet milk white bread). I made the dough in the bread machine, then baked it in the oven. The bread tastes delicious, but the loaf was WAY too big for the pan – it practically overflowed. I put it in a pan that says 8 1/2 x 4 1/2. Your recipe says it makes 1 8×4″ loaf correct? 🙁 I did use spray on the bottom of the pan prior to placing my dough in there, so I dont know what happened. Maybe the dough was already moist enough? I dont know . . .
I’m sure it tasted wonderful even if the side wasn’t perfect. I use Baker’s Joy–even on nonstick pans so the bread will slip out easier. Also, a plastic knife/spatula like the one seen here works perfectly to loosen the loaf in the pan before you try to remove it. I try to remove the loaf within 5-10 minutes, carefully, and then allow to cool on a rack. Hi, thank you for the guidance! I am trying to make a dough in my hand-me-down bread machine. I have never used one, but there is no dough button. I can’t find the user-manual online, but it does say dough:10 on the front. So I went to 10 (which I guess means 10 hours to the machine) and now it is counting down. I tried opening the lid, made sure the hook is working by starting and stopping it, but now at 7 hours left the hook is still not running. How long does your dough cycle take? I can’t find any reference on length of time. Thanks! can you cut the recipe ingredients in half and still get good bread machine bread? It depends on the size of your bread machine and the way it kneads bread. If there is not enough flour/dough for the blade to knead it properly, it won’t be so good. If your have recipes in your bread machine manual that call for as little as 1 1/2 cups of flour, then it will probably work. Since my bread machine recipes don’t involve baking in the machine, only the mixing and kneading, you will probably be fine. Definitely cut them down to 2 cups of flour and everything else accordingly if you must bake in your mini machine. Thank you so much for your quick response. I will try this with the rolls recipe that everyone has been raving about and let you know how it comes out with the mini zojiroshi. I translated your comment into English but it didn’t make much sense. Maybe somebody reading this who knows both Spanish and English can help me out. Well I got a Kenmore breadmachine and I have been using it often trying to perfect the shape. Being in Utah at high altitude makes it difficult to perfect the dough but I’m trying. I have not used the oven method yet. Has anyone ever made bread in a machine that looks like it was baked in the oven?????????? I’ve got two bread machine recipes to use for Christmas. One is savoury, ( a garlic bread ) one is sweet ( cinnamon cream) . How long do I bake each loaf in my regular oven. I really want these loaves to be pretty and not have the kneading paddle baked into the bottom. Just got a bread maker and want to try your recommendation of baking the bread in the oven. Is it better to just use the dough program even if making whole wheat bread? Or would it be better to use the whole wheat bread program and just cancel it before it gets to baking? It it was me, I would go with the dough cycle, even with whole wheat. Quite possibly, the dough won’t double by the time the dough cycle ends (because whole wheat dough tends to be a slow poke) so just leave it sitting in the bread machine until it does. Enjoy your new machine. Thanks much, Paula! Now I’m going to betray what a beginner I am to bread making by my next question :)… Then do I simply transfer the raised dough to a greased baking pan and bake ….will it lose some of it’s “gas” in the transfer? If you use one of my recipes, it will tell you to gently depress the dough to get the gas out when the dough cycle is complete, after you remove the dough from the machine. Then you shape it and place it in your bread pan. Cover and let rise again until dough is almost doubled. Now bake in preheated oven. I would encourage you to try one of my recipes first before you try to modify a regular recipe. Just for the record, whole wheat bread can be difficult for beginners and has discouraged many a newbie right out of the gate when they end up with something resembling a brick. I would try this one first and then this whole wheat loaf. Thanks so much, Paula, for these helpful recommendations. I’ll start there! I made some Focaccia Bread dough using my bread machine. Minutes later, I wanted to make dough for sweet dinner rolls in the machine, but the machine had to rest for about 2 hours interval before starting to work the dough. Why is that? Why can’t I make two different dough in succession? Waiting impatiently for you reply. Many thanks in advance. So sorry this answer is delayed. We have been on vacation. I make dough in succession just as you described in my Zojurishi. All of my various machines reset if you unplug them for a bit. What brand are you using? and before the last rise I too the paddles out and no more holes. It comes out just like in a bread pan. Don’t you still get small holes where the posts are? (My machine had two.) Also, I don’t like the thick crust you usually get when baking breAd in a bread machine. Have you found a way around that other than baking in a regular oven? I’ve done the add water/flour trick before and it works well. My machine does a 5 min knead or mix, a seven min rest, and a 12 min knead followed by a 40 min rise. then you dump the dough and let it rise 30-40 min. The recipes then say to punch it down and go from there with forming the loaf, baguette, etc. What does punching it down mean? I made a pumperknickle and just plopped it out, floured it a bit as it was sticky, and then let it rise to about 2x’s and baked at 400 for about 1/2 hr. Used an eggwhite glaze. Came out good, but got a bit crumbly the second day. Most bakery loaves a usually a bit less crumbly. What gives? My best guess is the bakery is adding some kind of gluten similar to vital wheat gluten. It will make the bread dough a little more elastic and cause it to rise higher. You might want to experiment a bit. I am no expert on pumpernickel since I don’t much care for it, so probably shouldn’t even speak about it. I just got a new bread machine, made 2 loaves and they both came out terrible, flour on the bottom of the pan,doughy, only half risen, I followed the directions and recipe that came with the manual, don’t you usually add the water first and then the dry ingredients? This one says to add the liquids last, wonder if that can be the problem. any ideas? This recipe also calls for only 18 oz of flour thats only a little over 2 cups, which does not sound right. I don’t know if you have read through many of my posts about bread machines but my first rule is, “Don’t bake in a bread machine.” Use it to mix, knead, and raise your dough, then remove it and bake in a conventional oven. This allows you much more control and results in a product as good or better than bread from a bakery. I would also recommend you try some of my recipes for a bread machine, like the Sweet Milk White Bread. I love your site! I am interested in bread-making but have never done it. The reason I want to begin is to try and control sodium levels in our bread at home. How can I alter recipes to have less salt? I know I probably cannot just omit the salt, but do you have any suggestions? Thank you! Hmmm. That’s a tough one. I have forgotten to add salt to my bread before and it was not good at all. Not only was the taste bland, but the dough didn’t rise the way it should. Perhaps somebody else will see your comment and have an idea. I just discover your site. I make our bread because my husband is on a strict sodium restricted diet. In fact that’s why I bought my machine. I have a wonderful low sodium cookbook that gives bread machine recipes. From what I’ve gleened from the from the book is that salt is used in bread to retard the rise of the yeast. The suggestion is to half the amount of yeast to compensate for the lack of salt. I make bread or rolls from this book weekly and have never had a problem with the rise, taste or texture. 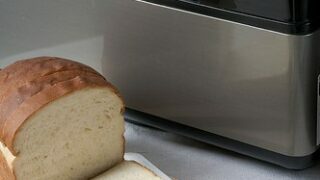 One recipe that I use for Amish white bread suggests when the machine beeps to let you know to remove the paddle, to turn turn the machine off and run it through another cycle, giving it another rise. This makes a very soft loaf, but if the bread is removed and shaped, and let Ross again, this wouldn’t be required, only if the machine is to bake the bread. Hi. I’m wondering if you can tell me what I can do to my bread recipe I make it more moist when it is finished. Mine is coming out a bit drug and dense. Ashley, are you letting it bake in the bread machine? If so, I don’t recommend it. What recipe are you using? I would love to help but need more info. this morning instead of lovely baked bread I came down to a very hot mix of dry ingredients. I had forgotten to put in the liquid the night before! I tried to manually add water and kneed, rest and then shape and bake but got a doorstop. The flour was baking hot of course. Had the yeast been killed? Could I have saved the mix somehow?? Could I have made soem sort of flatbread? What is the difference between bread machine yeast and instant yeast? I cant find any bread machine yeast here in the Philippines. Any suggestion? Bread machine yeast and instant yeast are interchangeable. They are both formulated to dissolve easily. Regular dry yeast will also work in a bread machine if you know what you are doing. I just got a bread machine. Used it three times. Made dense, not so good bread. Found your site and tried your recipe….LOVE it! The biggest help was the pics of how my dough should NOT look and how it SHOULD look! Thank you so much, I was about to give up! I’m so glad you found my site. The fabulousness of bread machines is a well-kept secret–to those who don’t know that it’s better not to bake in them. Wishing you much success with bread-baking. Paula, just found your website via pinterest, and i’m so glad I did! I found a bread machine at a garage sale today for $7, and I am super excited to get baking! Your tips are so very helpful. I will be sure to oven bake my bread after I mix it up! My family will be enjoying some of your recipes VERY SOON! I’ve been looking for help with using my bread machine. Your tips and photos are great! I was given a really basic bread machine (just has a stop/start button) by a friend who wasn’t using it. Up till now I’ve been baking in the machine. The dough rarely rises as high as it should, but the bread tastes good. I’m going to try just making the dough in the machine and baking in the conventional oven, as you suggest. The pan only holds 2 cups of flour. Can your recipes by adjusted for that small of a machine? How long would you suggest baking a smaller loaf? Christina, Yes, my recipes can be adjusted but may take some experimenting and tweaking. How long you need to bake your loaf depends on so many different things, it’s hard to recommend a certain time. I suggest you get a quick-read cooking thermometer (digital) and test your bread. It should reach 190 degrees F in the middle. Even though I’ve been making bread for many years, it’s a foolproof way for me to know when my bread has been in the oven long enough. I just stumbled onto your blog, and I am so glad I did! Thank you for providing such great information on bread machines. I just inherited a beautiful machine a few weeks ago. I was so excited to start using it, but soon realized I didn’t know where to start! This post is just what I needed. Thank you! You’re welcome Diana. May you have many successes! I’m trying this today. My question is….if I am making a recipe for a 2lb loaf, would that go in one pan or would/should I separate it into two loaves? I have two bread machines. I’ve over used the one apparently b/c it is a bit diva-ish and won’t turn on for me if I’ve made a loaf of bread the day before. Up until this point I have just let the bread go through the entire cycle of mix, raise, bake. But, since I am using the square loaf pan today I wanted to pull it out and shape my own bread. I made your sweet milk white bread and it came out fantastic the very first time. Can’t wait to try more of your receipes. Thanks! Glad to hear a good report on that bread. It’s a huge favorite in our family. Hello, I just stumbled upon your blog (oh happy day!) and am wondering if you have ever tried gluten free bread in your bread maker? I tried this weekend and it was a hot mess! hi paula, just wanted to let you know that i decided to keep the toastmaster because it keeps the dough warm after the cycle which really helps the dough rise esp during winter when the kitchen is a bit cold. I’m a student and don’t entertain much so I really need just one 🙂 Thanks for the help! Hi! So I just bought 2 used breadmakers and I’m not sure which one to keep. Can you help me decide? One is a little newer and has a timer and 9 settings (3 basic, 3 whole wheat, sweet, dough, french). Its a BMR 200 by Mr. Coffee. It has a timer that also works on dough setting. It has 2 lb capacity. The bread pan is on the tall side. Takes up a lot of counter space. The other one is a little older, a Toastmaster 1148x. 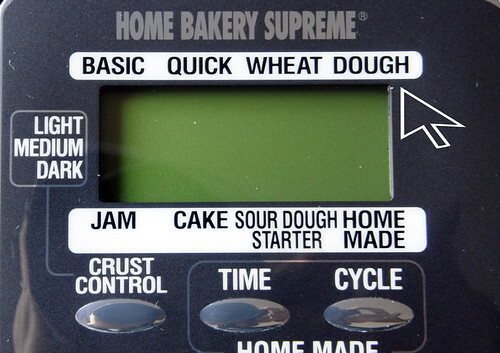 Its got 8 settings (3 basic, whole wheat, sweet, fast bake, french, dough). the timer doesn’t work on the dough setting but you can add ingredients while baking (it beeps when its time). The bread pan is squarish. Very compact. Hi Leslie, Here is what I would do. Make the same dough recipe in each one since they’re already used. If it was me, I would use my favorite dinner roll recipe on my blog. 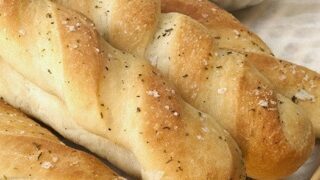 https://saladinajar.com/family-recipes/favorite-dinner-rolls I would look at which machine mixes and kneads the dough best without leaving flour or other ingredients unmixed in the corner. Which machine makes the silkiest, smoothest dough? Since I don’t cook in mine, I don’t care about about the shape of the pan or how evenly it bakes. Take it into consideration if you care. I personally like a timer on the dough cycle. Sometimes I like to have the pizza dough ready to bake when I walk in the door from work or dinner rolls ready to roll out when I get home from church. Honestly, I use two machines for holidays and parties since people eat a lot more dinner rolls when they are homemade and hot out of the oven. Keep both of them if you like to entertain. If I had to choose, it would probably be the Mr. Coffee. After three failed attempts at baking bread, i finally realized my kitchen is too cool and so was my bread machine, so now while i’m collecting all my ingredients I put a small amt. of hot tap water in the bread machine pan (to warm everything up) and close the lid, pour it out when ready and dry the inside because of all the moisture it makes and add the ingredients and I have had success every time since. Happy baking. So glad you shared your experience here. Maybe it will help someone else who is less than thrilled with their bread machine. They really are fabulous. I just scored myself a used bread machine for $10. I’m psyched to try it out! That’s great. Hope it makes good bread for you Cindy. I’ve loved the breads I’ve made in the last few years, and would probably love them more with a machine….. what a wonderful post! You need to write a book/cookbook on this subject – you are so knowledgeable! I love making bread. What a comprehensive blog entry. Thanks! Great tips in here, Paula! Happy New Years and cheers to another year in blogging. I love your bread posts, Paula! Always so mouthwatering. I think I know what I’m putting on next year’s Christmas wish list… 🙂 Happy New Year! For a TOTAL newbie, can anyone suggest a blog/website that will walk me through the steps after I’ve done the dough phase? Do I have to knead the bread again? Do I have to form it into a certain shape when I place it in the pan? Do i grease the pan? I am a total newbie, but really want to try my hand at doing this… I’ve made 2 in my breadmaker so far and agree, dont’ like how it bakes. Ann, I suggest you pick one of the easy recipes I suggested. It will give you the steps you are asking about. Oh I love this blog!! I wish I still had my bread machine. I got rid of it over a year ago. I wasn’t happy at all with the bread it made. Now that I know these secrets, I may have to get me another one and start baking my own bread. Lori, Most of the new ones are better than most of the old ones anyway so you may be in luck. You’re welcome Daphne. It is so much fun to hear about your bread-baking adventures. I have the exact same bread machine and love making bread, but it doesn’t always come out as beautiful as yours. I always weigh my ingredients before mixing for a more accurate measurment in hopes of producing a more professional looking loaf. Do you know where one would find bread machine yeast? Also, what should the internal temp of my bread be and o you find the golden crust to be an accurate indicator that your bread is complete? Thanks! Christine, A golden crust is not a reliable indicator. Many breads, especially the ones with more sugar brown quickly and in fact, need to be shielded half-way through to keep from burning. That is why a thermometer is so handy. Takes the guess work out of the whole matter. I sometimes see where people recommend taking the loaf out of the pan and thumping to see if it’s done. That works about as well for me as thumping watermelons at the store. NOT VERY. Measuring your ingredients, especially the flour is a great idea. However, learning to judge the correct consistency of the dough so you can add the appropriate amount of water or flour if needed is even more helpful. Bread baking is NOT an exact science and small adjustments may be necessary to get the perfect loaf. I love my thermometer for everything else I bake, but I never even thought about using it for bread. What temp should a finished loaf of bread be? Great idea to use the dough cycle and then bake in the oven. I’ll do that from now on. I don’t like the square shape of the bread machine. I use my machine to make my own whole wheat pizza dough, since it can be hard to find. I totally agree about the weird shape. Then there is the hole(s) in the bottom from the blades. Not nice! I take the blade out after the last turn which is about one hour and forty minutes. The bread is left only with a very little hole. I am making bread for 12 years and I enjoy every minute of it. I never thought about taking the blades out! Thanks for the tip. Fantastic post, Paula! So true about the home temperature. Drooling over your dinner rolls…they look amazing. Took me awhile to figure that one out. It’s one of the most common reasons for failure when somebody also uses the machine to bake their bread. Their house temperature may have been too low to allow proper rising but the machine can’t make the adjustment. I never could understand why people leave their bread machines unused or even sell them at garage sales. I think mine has lasted so long because I very seldom bake in it. I think I will invest in a thermometer though. Never used one for baked items. Looking forward to the wonderful posts you will have for us in 2011. Best wishes for a Happy New Year! Thanks for the bread machine tips- I don’t use mine nearly often enough. It’s good to get some inspiration to pull the old girl out and give her a space on the counter top. 🙂 Like you, I only use mine to mix and proof- what a time saver!